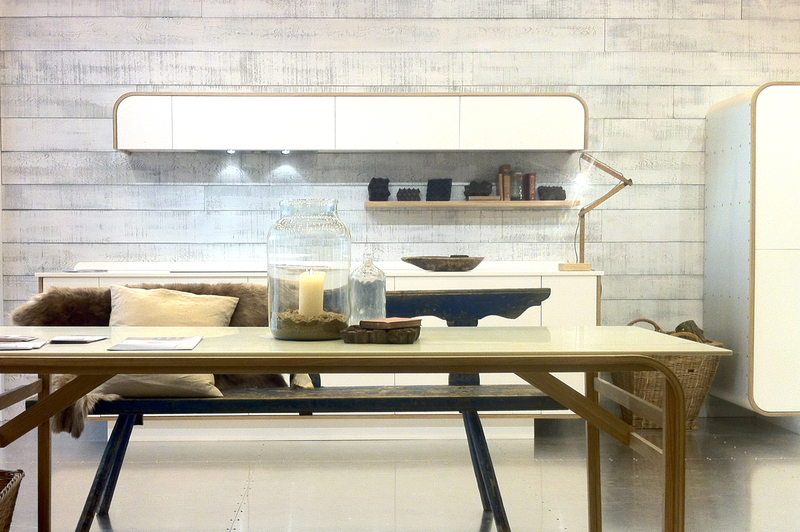 the Air range by deVOL returned to earls court for this years 100% design show – the UKs largest contemporary design trade event. 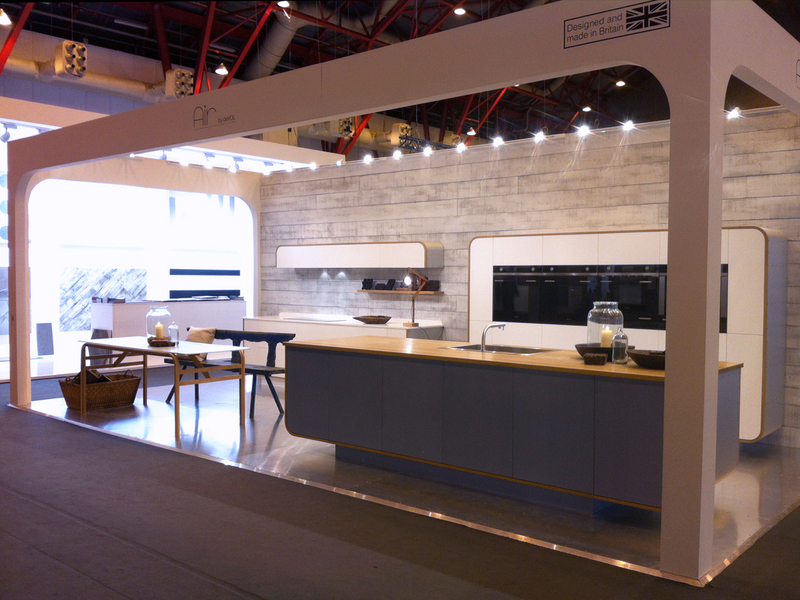 Air is a modern kitchen range by the design-led furniture manufacturer and was introduced as a concept kitchen at last years show. this year, with a larger stand, it was a chance to showcase an expanded and refined range as well as a few surprises to highlight the companies roots in traditional british craftsmanship. 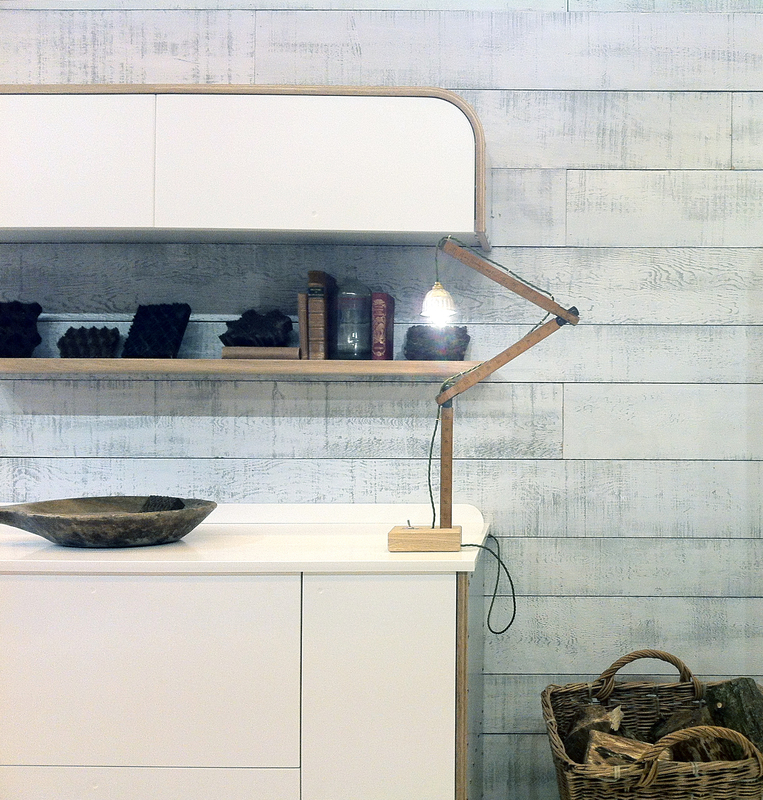 over 65,000 design professionals registered for this years show – the largest number yet. before they all flooded in i managed to take some snaps of the stand. the set was designed to feel very homely but finished with a combination of materials and textures that gave the space an edgy and distinct look. the flooring is aluminium and was beautifully scuffed by attendees. the walls were clad with large planks of rough sawn oak and offered a stark contrast to the solid-surface doors. 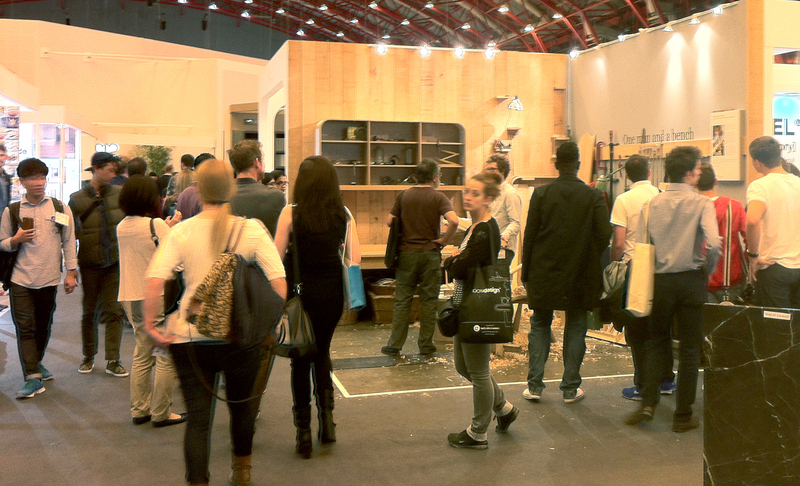 many people came to the stand just as interested in the set design as much as the kitchen! all of the Air furniture you see was designed and built specifically for the show. the expanded range includes a new flip-up wall cupboard and a large free-standing appliance bank. the large double island also returns, finished with a couple of very neat internal, pop-out oak drawers. Air is built by hand from the ground up and styled around a blend of subtle retro cues with a crisp, contemporary twist. the design is all about the attention to detail – there’s not a single sheet of mdf or chipboard in sight and the structural elements of the oak frame and rivets are fully exposed for all to see. the feel of the furniture is also important from the smooth action of the doors to the texture of the thick oak worktop. also on display was a prototype table constructed using the same methods as the Air furniture. its an example of whats possible with the design and offers a glimpse into what might be in store for the range. in addition to showcasing Air, there was a nice surprise just around the corner: one man and a bench was a small open space that acted as a behind-the-scenes insight into deVOL where everything the company produces is designed and built by hand in workshops at loughborough, england. 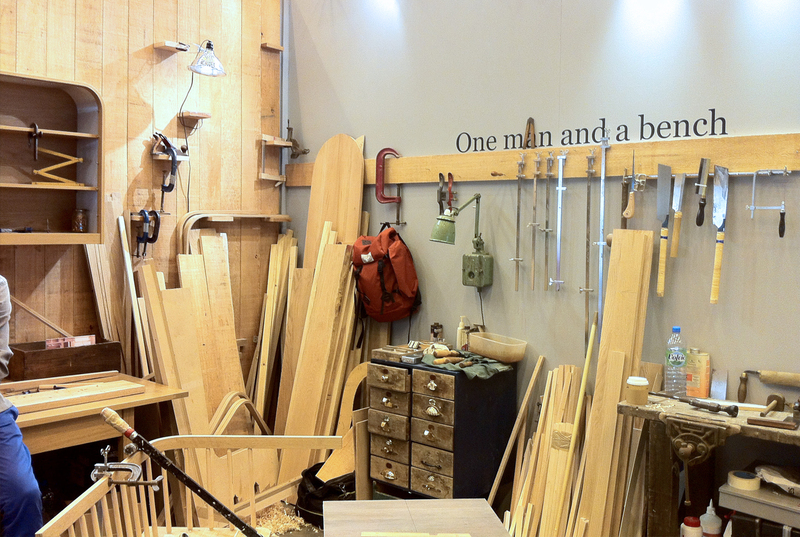 deVOLs workshop manager, ben, was the ‘one man’ who would be making something on his bench from scratch throughout the show. he gave a live demonstration of traditional british craftsmanship techniques and offered visitors the chance to get up close to the tools and materials. the demo offered something very different to the show and unsurprisingly it was an absolute hit. we were overwhelmed by the number of positive comments and the small space got a lot of attention from people from all sorts of design backgrounds. sadly i didn’t have time to see the entire show (or the rest of the london design festival!) but from quick glimpses at lunch it was clear that 100% design has really upped its game in the last few years. it was an enjoyable show to attend with a lot of interesting spaces and ideas. it was also great to meet and chat to so many people. ultimately though,it was great to see people were still interested in traditional ways of making things at an exhibition rammed full of 3d printers and space-age showers. 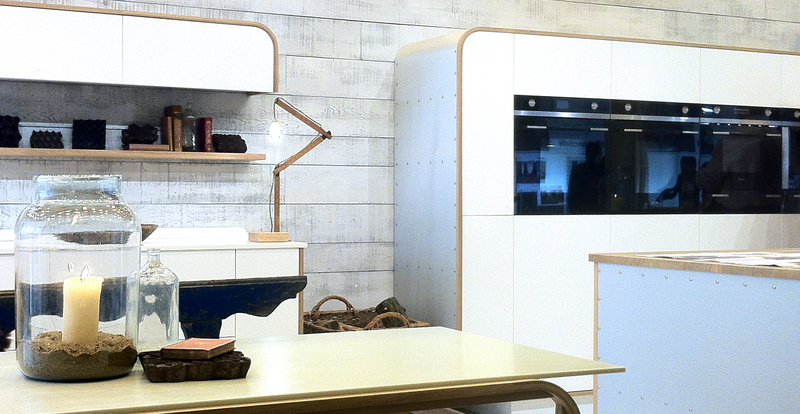 hopefully the Air kitchen and ‘one man…’ altered peoples perceptions on british design and manufacturing.